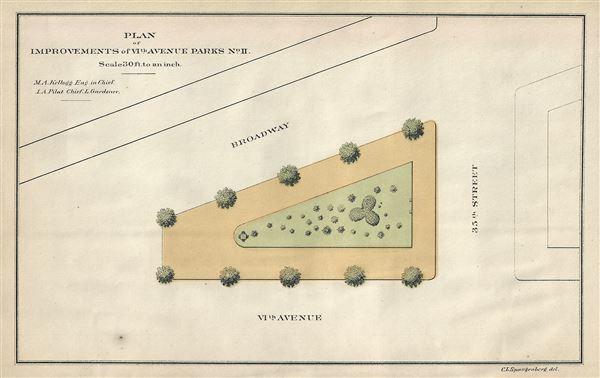 Plan of Improvements of Vith Avenue Parks, No.II. This is a scarce 1871 map of Herald Square in New York City by Kellogg and Pilat. The map shows the plans of improvement of the square located between west 34th st and west 35th st and between Broadway and Sixth Avenue. It depicts the location of trees and shrubbery within the triangular square. Herald Square, along with the southern Greeley Square form a bot-tie square in Manhattan. Named after the New York Herald newspaper, which was located on the square, it formed part of the old printing and newspaper district of New York. Soon the surrounding area became known as Herald Square. Today the square consists of tables and chairs, providing a rest area for the thousands of shoppers in this retail hub. This plan was created by Parks Engineer in Chief M. A. Kellogg and Chief Landscape Gardener I. A. Pilat for the First Annual Report of the Board of Commissioners of the Department of Public Parks for the Year Ending May 1, 1871.